ESCAPE FROM NEW YORK: Carpenter Blazes A Post-Apocalyptic Trail – Schlockmania! From 1976 to around 1988, John Carpenter enjoyed a golden age of filmmaking that is beloved to genre fans the world over. Whether you’re talking about Halloween or his remake of The Thing or Big Trouble In Little China, this array of distinctive, carefully-crafted films all have a fan base. 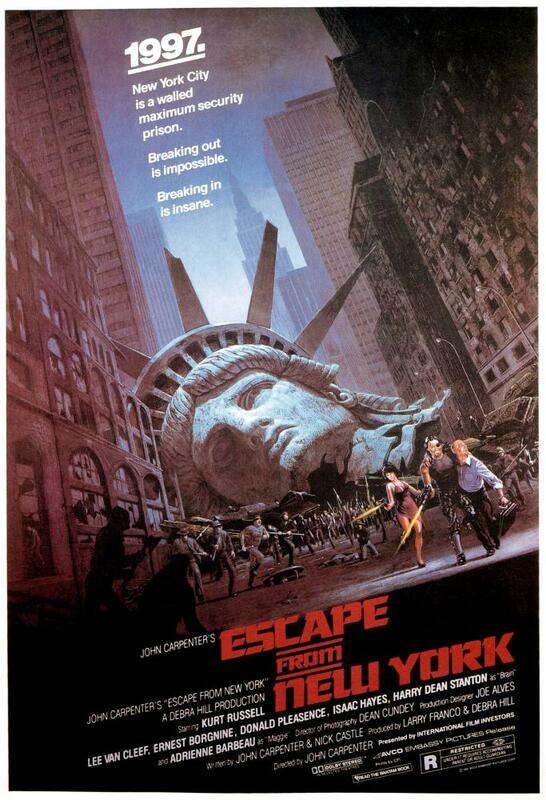 The most influential film to emerge from this pack outside of Halloween has to be Escape From New York. It offers a mixture of dystopian sci-fi, pulp adventure and tough guy action that stands alongside The Road Warrior as one of the most imitated films of its time. Escape From New York takes place in a police-state future where Manhattan has been transformed into a closed-off prison island. It suddenly become the most important piece of dirt in the country when terrorists force Air Force One to crash over it, leaving the President (Donald Pleasance) stranded on it with all the human refuse. 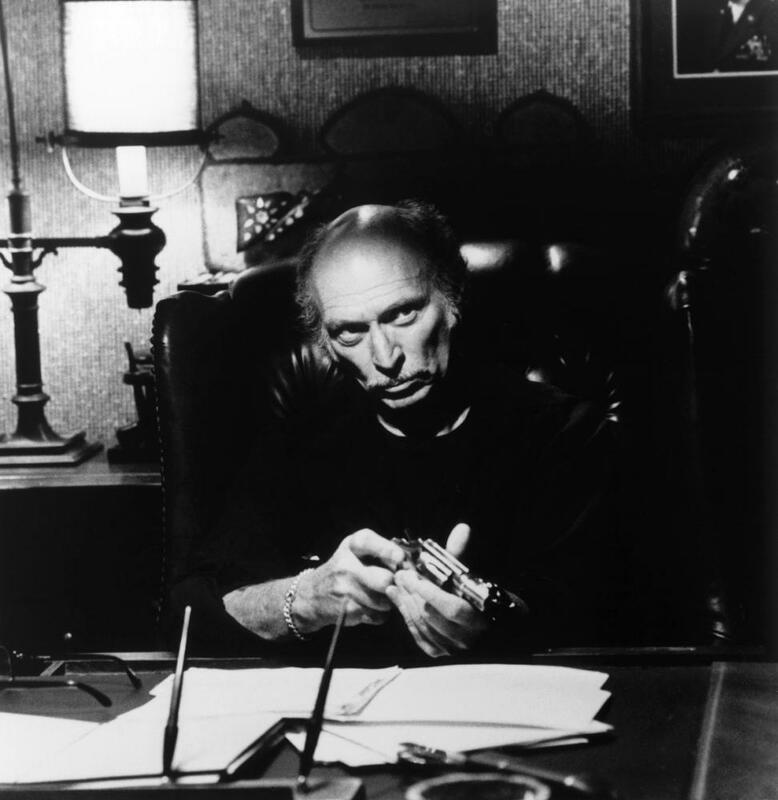 The island’s “Police commissioner” Hauk (Lee Van Cleef) quickly realizes he’ll have to send someone into this viper pit to rescue the President, someone who can deal with the inmates on their own level. That man is soldier-turned-convict Snake Plissken (Kurt Russell), who has just been sentenced to imprisonment on Manhattan. He’s given 22 hours to bring the president back, with freedom in the offing if he can pull it off. Thus, Snake undertakes a bizarre, violent odyssey to find the nation’s leader, one that leads him into contact with unlikely, potential traitorous partners like Cabbie (Ernest Borgnine), Brain (Harry Dean Stanton) and Maggie (Adrienne Barbeau). 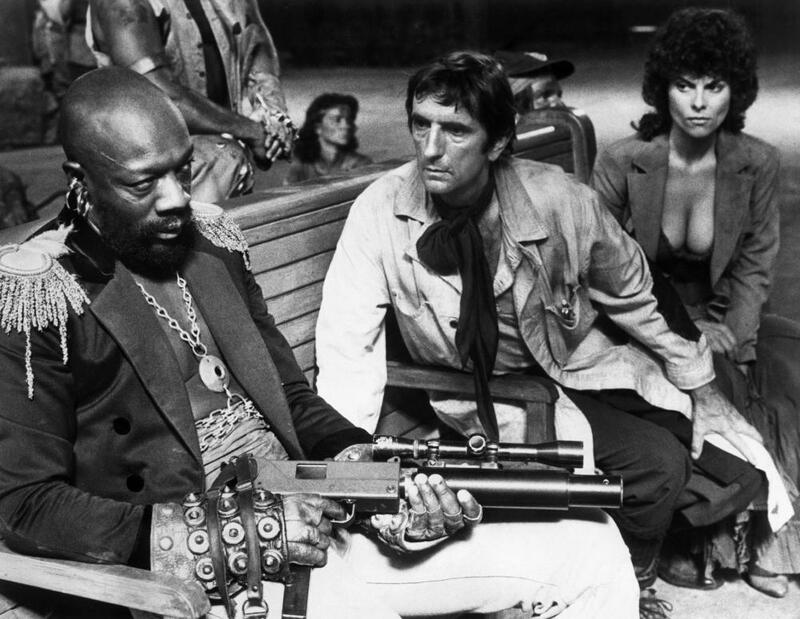 Worst of all, he’ll have to tangle with the island’s de facto boss, the Duke of New York (Isaac Hayes). With a premise and a cast like that, Escape From New York is the kind of celluloid proposition that is guaranteed to win over genre fans with little effort. However, the beauty of the film lies in the effort that Carpenter invests in making this pulp premise live up to its potential for excitement and badass attitude. The scr ipt, co-penned by Carpenter with Nick Castle, lays out the tale in a suspenseful, constantly unfolding way as its ticking-clock premise gets ratcheted to higher and higher levels of tension. It also boasts a fun, sarcastic sense of humor that gets its greatest expression in the terse yet witty dialogue (a classic running gag has people telling Plissken they thought he was dead). Most interestingly, it is free of cheap melodrama or attempts to cater to audience sentimentality: it’s a film full of tough people who constantly face death and do so with a survivor sensibility and gallows humor. Just as important is the visual construction: Carpenter wrings every drop out of his modest budget, sparingly using visual effects to create the broad strokes of its futuristic elements and incorporating ace production design by Joe Alves to create its urban variant on a post-apocalyptic setting. He stages the film’s action and suspense sequences with equal aplomb: whether Snake is squaring off with a building full of zombie-like crazies or racing across a heavily-mined bridge to dodge his foes, it’s all assembled with crack timing and careful framing (kudos to Dean Cundey for his starkly-lit Cinemascope photography). However, Carpenter’s single smartest move as director here might have been his casting. It’s easy to forget that Russell was thought of as merely a former Disney kid star when he appeared in Escape From New York but he justified Carpenter’s faith in him with a darkly charismatic performance that mixes convincing machismo and deadpan wit. It set the tone for the rest of his career, which would include more suitably macho pairings with Carpenter in The Thing and Big Trouble In Little China. The rest of cast backs him Russell beautifully: Van Cleef provides an older version of tough guy charisma for Russell to bounce off of, Hayes is subtly effective as a quietly crazy villain and Stanton and Barbeau make an intriguing roles-reversed version of a post-apocalyptic couple, with he as the asset and she as the protector. Elsewhere, Borgnine provides a grace note of childlike charm amidst the psycho-laden rubble and Pleasance has a lot of fun coming unglued when exposed to how his country’s other half lives. 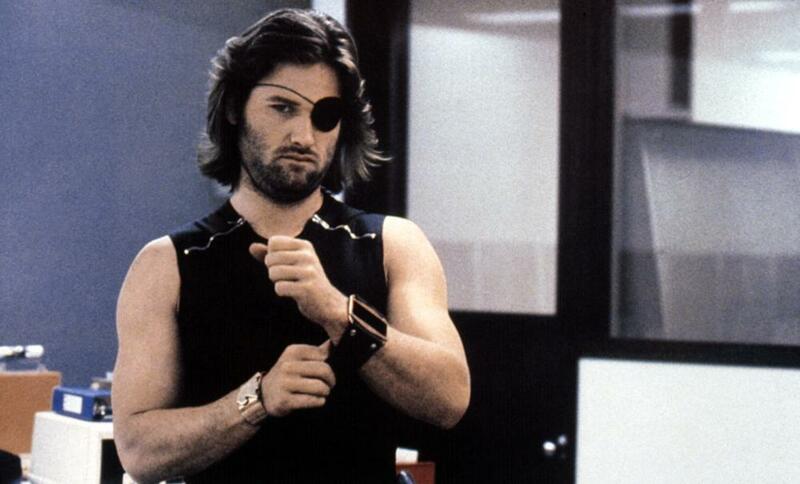 All in all, Escape From New York remains a jewel in the crown of John Carpenter’s golden era. A lot of post-apoc action flicks that followed, particularly 1990: The Bronx Warriors and After The Fall Of New York, would borrow heavily from the story and visual style created here. However, few of them captured the mixture of fun pulp concepts and rigorous craftsmanship that Carpenter so effectively captures here. As a result, Escape From New York is both an important part of genre flick history and a still-vital example of smart filmmaking.